Remember our Family Day FunZone earlier this year? Proceeds from our annual event went towards the Education Foundation of Niagara. The Education Foundation of Niagara provides support to children in schools throughout the Niagara Region where government funding is not available. After running our FunZone back in February, we presented the EFN with a cheque for $1000! These funds will go towards supporting students with the basic necessities and help them with extra-curricular activities. Donations like this one also fund bursaries and support progressive programs that enrich the educational experiences for students. Nancy Schappert presents Nicole Smith of EFN with $1000 Donation. Why do we support the EFN? We have been a proud supporter of the Education Foundation of Niagara for over 5 years. 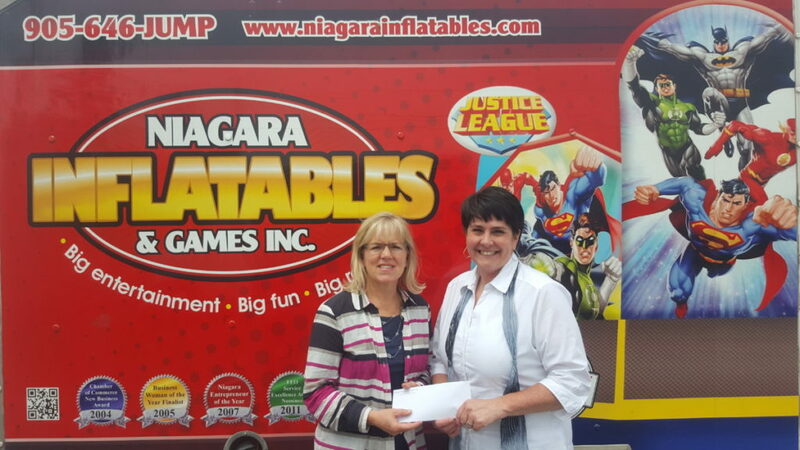 For Niagara Inflatables and Games’ 10th Anniversary, we donated $10,000 to the EFN. These funds were then distributed to 10 different schools to support their breakfast programs. Since then, we have been a partner and supporter of the foundation by supporting their annual Trivia Night with popcorn and this past year donating $1,000 of proceeds from our Annual Family Day Fun Zone at the Scotiabank Convention Centre to the Education Foundation of Niagara! As well, owners Scott and Nancy Schappert are proud to personally make and serve Banana Pancakes every Wednesday morning at Lincoln Centennial School! Niagara Inflatables strongly believes that not only should children have the best in entertainment, but great educational opportunities as well. As we celebrate our 15th Anniversary we have dedicated our anniversary to the theme of Super Heroes. We are happy to reinforce this theme by helping build tomorrow’s Super Heroes in our community!